The DataMan 152/262 readers offer higher resolution (1280x960pixel) for the most demanding applications. 1DMax™ with Hotbars II™ and 2DMax® with patent-pending PowerGrid™ technology decode damaged or poorly printed 1-D and 2-D codes, despite code quality, printing method or surface that the codes are marked on, and can even read 2-D codes without visible perimeters or quiet zones. Cognex announces the release of its fastest and most economical industrial handheld readers yet, the DataMan® 8050 Series. Designed with a ruggedized housing to handle harsh factory floor conditions and equipped with Cognex’s world-class barcode reading algorithms, the DataMan 8050 Series can read even challenging barcodes quickly and easily. DataMan 9500 mobile computer was specifically designed for the rugged conditions of the factory floor. This industrial-grade mobile computer is ideal for reading DPM (direct part mark) codes in applications where operators need to read and view code data but cannot be stationed at a terminal or PC. The DataMan 300 series of readers was developed to handle the most difficult-to-read DPM (Direct Part Mark) codes as well as challenging 1-D linear barcodes and 2-D Data Matrix codes and for indexed or high-speed lines. 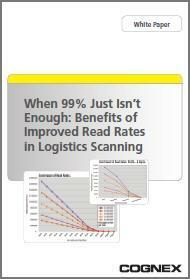 This white paper will explore how improving barcode read rates with new image-based technology can shorten return on investment (ROI) of capital equipment.